Diabetes mellitus, Rats, Cognitive function, Alpha lipoic acid, p22phox0. Diabetes can lead to cognitive dysfunction, whose clinical manifestations are declined learning and memory ability, and even dementia . Studies have shown that diabetes is an independent risk factor for dementia . However, the specific mechanism is not clear. What's more, currently, there is no reliable and effective treatment for dementia induced by diabetes. Oxidative stress plays an important role in the development of diabetes complications . Oxidative stress refers to an imbalance between oxidation and antioxidant in the body and will lead to the production of a large number of free radicals, resulting in tissue damage. Superoxide dismutase (SOD) and glutathione peroxidase (GSH-Px) are important anti-oxidative enzymes in the body, which can reflect the antioxidant capacity of the body . Malondialdehyde (MDA) is the most important product of lipid peroxidation, which can reflect the degree of lipid peroxidation of the body . NADPH oxidase, a key enzyme of oxidative stress, is the most important substance to stimulate production of reactive oxygen species, and p22phox is an important subunit of NADPH oxidase . α-Lipoic acid (α-LA), known as the universal antioxidant and a coenzyme present in the mitochondria, can eliminate pathogenic free radicals . Because it is both lipid and water soluble, it is able to reach all parts of the body. In this study, α- LA was used as an intervention factor, and the changes of cognitive function, and levels of SOD, GSH-Px, MDA and NADPH oxidase subunit p22phox in hippocampal tissue in streptozotocin (STZ)-diabetic rats before and after treatment were observed to explore the effect of α-LA on cognitive function of diabetes mellitus and its mechanism. α-LA injection and STZ were purchased from Yabao Pharmaceutical Company, Shanxi, China, and Sigma-Aldrich Chemical Company, St Louis MO, USA, respectively. SOD, GSH-Px, MDA assay kits were purchased from Jiancheng Biotechnology Co., Ltd., Nanjing, China. The Morris water maze was manufactured by Huaibei Zhenghua Equipment Co., Ltd., Anhui, China. Experimental grouping and model preparation: Thirty healthy clean grade male SD rats weighing 150-170 g were purchased from the Animal Experiment Center of Hebei Medical University. After one-week adaptive feeding, rats were divided into the normal control (NC) group, diabetes control (DC) group, and diabetic lipoic acid (DL) group, with 10 rats in each group. Then rats were fed for 18 weeks. Rats were given intraperitoneal injection of STZ (60 mg/kg). Rats whose tail vein plasma glucose levels were no less than 16.7mmol/L were viewed as STZ diabetic rats. From the week 13 to the week 18, rats in the DL group were given intraperitoneal injection of α-LA (60 mg/kg), while rats in the DC group were given intraperitoneal injection of the same amount of normal saline. Morris water maze experiment: The Morris water maze experiment was performed on rats in each group in the week 1, week 12 and week 18. Morris water maze is a round pool, 150 cm in diameter and 60 cm deep. The pool was divided into 4 quadrants. The platform is 40 cm high, and located in the center of the first quadrant. The water depth was set at 42 cm, and milk powder was poured into water in order to make it milky white. The water should be within one degree of 25°C. The experiment was conducted for 5 days. The first 4 days were for training, every day of which rats were trained in each of the 4 quadrants for 1 time. On the fifth day, rats underwent testing. The escape latency (the time rats take to find the platform after placed into the water) was recorded. Tissue preparation and detection of SOD, GSH-Px, and MDA in hippocampus tissue: Rats were anesthetized by intraperitoneal injection of 10% chloral hydrate (3 mg/kg) and underwent craniectomy (in a sterile condition) at the end of the week 18. The hippocampus tissues were placed in liquid nitrogen and stored at -70°C in the refrigerator for the detection of SOD (the xanthine oxidase method), GSH-Px (5,5'-dithio-bis(2-nitrobenzoic acid)), MDA (the thiobarbituric acid (TBA) method). The operation was conducted according to kit instructions. Detection of mRNA of NADPH oxidase subunit p22phox in hippocampus tissue: According to instructions of Trizol kits (Invitrogen Inc., Carlsbad, CA, USA), the total RNA was extracted from the hippocampus tissue. Reverse transcription was carried out according to the instruction of TaKaRa reverse transcription kit. The reaction system was 10 μl. The conditions were 37°C for 15 min and 8°C for 5 min. NADPH and β-actin primers were synthesized by Sangon Biotech (Shanghai) Co., Ltd. (Table 1). Real-time PCR was carried out using ABI PRISM 7000 HT, with the reaction system of 20 μl. The procedures for two-step PCR were listed as follows: initial predenaturation at 95°C for 30 s; followed by 40 consecutive cycles of denaturation at 95°C for 5 s and extension at 60°C for 34 s. The Ct valueswere obtained and the comparison between group was performed according to the formula: Folds=2(-ΔΔCt). Table 1. Sequences of NADPH and β-actin primers. All data analysis was conducted using SPSS (version 13.0). The results of water maze test were analyzed by repeated measures analysis of variance (ANOVA). Count data were presented as (͞x ± s). Comparisons between groups were performed using one-way ANOVA. A P value of less than 0.05 was considered statistically significant. Rats in the DC group were apathetic and retarded with thin skin. “Three polys and one little” symptoms were obvious. During the intervention process, the condition of rats in the DL group was better than that of rats in the DC group. Rats in the NC group reacted adroitly with luster hair colors and normal diets. As shown in Table 2, in week 12, the escape latency of the DC group was not significantly different from that of the DL group (P>0.05), while it was significantly prolonged compared with that of the NC group (P<0.05), indicating that diabetes had caused cognitive dysfunction in the DC group. Table 2. Results of the Morris water maze experiment. In week 18, the escape latency of the DL group was significantly shortened in comparison with that of the DC group (P<0.05). However, it was still longer than the escape latency of the NC group (P<0.05), indicating that α-LA can ameliorate cognitive dysfunction caused by diabetes. 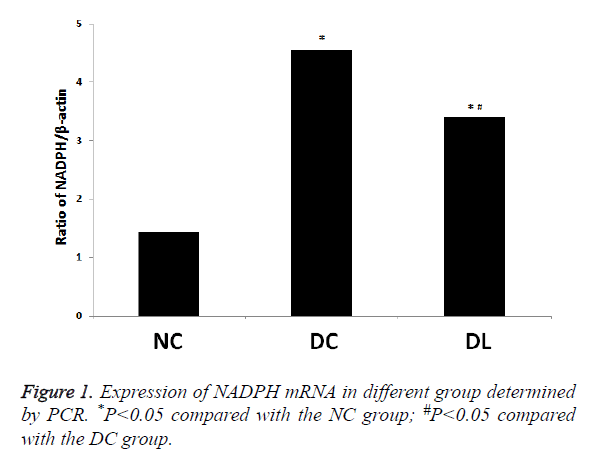 Comparison of mRNA expression levels of NADPH oxidase subunit p22phox: DC group>DL group>NC group (P<0.05). The mRNA content of the DC group was 3.16 times as much as that of the NC group (P<0.05). The mRNA content of the DL group was 2.36 times as much as that of the NC group (P<0.05) (Figure 1). Figure 1. Expression of NADPH mRNA in different group determined by PCR. *P<0.05 compared with the NC group; #P<0.05 compared with the DC group. • DC group>DL group>NC group (P<0.05). The MDA content of the DC group was significantly higher than that of the NC group (P<0.05). The MDA content of the DL group was significantly higher than that of the NC group (P<0.05) (Table 3). *P<0.05compared with the NC group; #P<0.05 compared with the DC group. Table 3. Contents of MDA, SOD and GSH-Px in different groups. • Compared with the NC group, the DC group and DL group showed declines of SOD and GSH-Px levels and an increase of MDA levels (P<0.05). • Compared with the DC group, the DL group showed increases of SOD and GSH-Px levels and a decline of MDA levels (P<0.05). • The above results indicate that the anti-oxidative stress ability of the brains of STZ diabetic rats' brains was decreased, and that α-LA could increase the anti-oxidative stress ability of STZ diabetic rats' brains. Diabetes mellitus is a metabolic disease characterized by hyperglycemia, which can involve the whole body, including the central nervous system (CNS) . With the increase of morbidity year by year, CNS lesions in diabetic patients, whose main manifestation is cognitive dysfunction, have attracted more and more research focus. Studies have shown that chronic hyperglycemia can produce direct toxic effects on CNS through oxidative stress, causing changes in functions and structures of hippocampal neurons, and leading to diabetic cognitive dysfunction . α-LA, known as the most powerful natural antioxidant , is both water and lipid soluble, which enables it to go through the blood-brain barrier smoothly and thus protect cerebral neurons . In recent years, the effects of α-LA on the CNS and cognitive dysfunction gain more and more attention. Tomassoni et al have confirmed that α-LA can protect the nerve tissue of patients with brain trauma and stroke . Hager et al. have found that α-LA can significantly slow rogression of Alzheimer's disease . Meanwhile, the number of studies on the impacts of α-LA on diabetic cognitive dysfunction is gradually increasing. Sharma et al have shown that α-LA could prevent cognitive impairment and oxidative stress induced by intracerebroventricular streptozotocinable to reduce the degree of lipid peroxidation in the brain tissue of STZ diabetic rats, and therefore alleviate cognitive impairment . In this study, α-LA was used as an intervention factor to treat STZ diabetic rats with cognitive dysfunction for 6 weeks. The escape latency in the Morris water maze navigation and positioning experiment was applied to evaluate the cognitive function in rats. The levels of SOD, GSH-Px and MDA were used to reflect the oxidative stress in hippocampus tissue. The results showed that in week 12 when the model was established, cognitive dysfunction (prolonged escape latency) occurred in STZ diabetic rats. A 6-week α-LA intervention improved cognitive dysfunction significantly (reduced escape latency). At the same time, the activities of SOD and GSH-Px, which reflect the antioxidant capacity of the body, increased. Also, the expression of the subunit p22phox of NADPH oxidase, the key enzyme of oxidative stress, was decreased. The level of MDA, which reflects the degree of lipid peroxidation in the body, decreased, indicating that oxidative stress levels in hippocampus tissue was improved. Therefore, we inferred that the ability of α-LA to improve diabetic cognitive function may be related to its strong antioxidant effects. Mechanisms TM, Glycation IN. Endoplasmic Reticulum Stress-Mediated Hippocampal Neuron Apoptosis Involved in Diabetic Cognitive Impairment. Biomed Res Int 2013; 2013: 924327. Stewart R, Liolitsa D. Type 2 diabetes mellitus, cognitive impairment and dementia. Diabet Med 1999; 16: 93-112. Son SM, Whalin MK, Harrison DG, Taylor WR, Griendling KK. Oxidative stress and diabetic vascular complications. Curr Diab Rep 2004; 4: 247-252. Santos C, Pires M D A, Santos D. Distribution of superoxide dismutase 1 and glutathione peroxidase 1 in the cyclic canine endometrium. Theriogenology 2016; 86: 738. Giera M, Lingeman H, Niessen WM. Recent Advancements in the LC- and GC-Based Analysis of Malondialdehyde (MDA): A Brief Overview. Chromatographia 2012; 75: 433-440. Von LK, Noack D, Jesaitis AJ. Mutational analysis reveals distinct features of the Nox4-p22 phox complex. J Biol Chem 2008; 283: 35273-35282. Maritim AC, Sanders RA, Watkins JB 3rd. Effects of alpha-lipoic acid on biomarkers of oxidative stress in streptozotocin-induced diabetic rats. J Nutr Biochem 2003; 14: 288-294. Ramírez-Zamora S, Méndez-Rodríguez ML, Olguín-Martínez M, Sánchez-Sevilla L, Quintana-Quintana M, García-García N, Hernández-Muñoz R. Increased erythrocytes by-products of arginine catabolism are associated with hyperglycemia and could be involved in the pathogenesis of type 2 diabetes mellitus. PLoS One 2013; 8: e66823. Wang WT, Lee P, Yeh HW. Effects of acute and chronic hyperglycemia on the neurochemical profiles in the rat brain with streptozotocin-induced diabetes detected using in vivo 1 H MR spectroscopy at 9.4 T. J Neurochemistry 2012; 121: 407-417. Lewis EM, Sergeant S, Ledford B, Stull N, Dinauer MC, McPhail LC. Phosphorylation of p22phox on threonine 147 enhances NADPH oxidase activity by promoting p47phox binding. J Biol Chem 2010; 285: 2959-2967. Yang Y, Wang W, Liu Y, Guo T, Chen P, Ma K, Zhou C. α-lipoic acid inhibits high glucose-induced apoptosis in HIT-T15 cells. Dev Growth Differ 2012; 54: 557-565. Tomassoni D, Amenta F, Amantini C, Farfariello V, Di Cesare Mannelli L, Nwankwo IE, Marini C, Tayebati SK. Brain activity of thioctic Acid enantiomers: in vitro and in vivo studies in an animal model of cerebrovascular injury. Int J Mol Sci 2013; 14: 4580-4595. Hager K, Kenklies M, Mcafoose J. Alpha-lipoic acid as a new treatment option for Alzheimer's disease--a 48 months follow-up analysis. J Neural Transm Suppl 2007; 72: 189-193. Sharma M, Gupta Y K. Effect of alpha lipoic acid on intracerebroventricular streptozotocin model of cognitive impairment in rats. European Neuropsychopharmacol 2003; 13: 241-247.